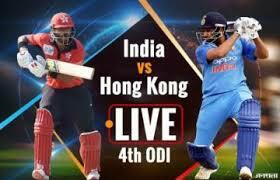 India vs Hong Kong 4th match of Asia Cup 2018 being played in Dubai International Cricket Stadium Dubai on 18 Sep 2018. Hi friends, I am Gyan Ranjan, In this blog post you will get a detailed description of this Ind vs HK 4th match of Asia Cup 2018. You can watch live cricket score and read to know special memorable moments. Nizakat Khan, Anshuman Rath(c), Babar Hayat, Kinchit Shah, Christopher Carter, Ehsan Khan, Aizaz Khan, Scott McKechnie(wk), Tanwir Afjal, Ehsan Nawz, Nadeem Ahmed. Kinchit Shah got a maximum of 3 wickets. Ehsan Khan 2, E Nawaz and A Khan got the 1-1 wicket. E Khan 22, K Shah 17 and Babar Hayat also supported with 18 runs but couldn't achieve team to the winning target. HK could score 259/8 in 50 overs and lost the match by 26 runs. K Khaleel Ahmad got 3 wickets in his debut match. Yajuvendra Chahal also got 3 wickets in this Ind vs HK 4th ODI match of Asia Cup 2018. Kuldeep Yadav got 2 wickets. Even India won this match by 26 runs but Hong Kong played a brave inning for which this match will be remembered for a long long time.